Journal Jottings : Life 13th-19th Nov 2017: Yoga, An Italian Experience & Visiting the "Boys". Life 13th-19th Nov 2017: Yoga, An Italian Experience & Visiting the "Boys". A week of exercise, sampling Italian food, visiting Chocolate and Marshmallow (you will have to read on to find out more) and ending with a frustrating computer breakdown. Bitterly cold day. Went to Melrose for the post office (we lost ours in the village earlier this year); also visited the library (in the square and so much more convenient than in Earlston where it is a good 20mim walk away in the High School. Of course to kill time before the bus back, we had to go to our current favourite offee shop/restaurant - Marmions - N. had coffee and walnut cake, whilst I opted for a delicious scone with wee pots of butter and jam - none of those fiddly little catering pats that are tricky to open! Home and made vegetable soup for lunch. Busy afternoon blogging. Allowed myself to be persuaded to keep C. company at a new yoga class in the primary school. I have never had the slightest bit of interest in yoga, so why on earth did I say “yes”? 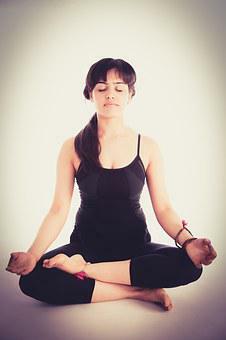 I was glad I went as a taster, but I haven't changed my mind - yoga is not for me. I feel much healthier, fitter and invigorated after going to Aquafit. Woke at 4.25am and could not get back to sleep, so a dozy start to the day. My equivalent to “counting sheep” strategy did not work e,g. counting 50 states of the USA, 32 old counties of Scotland, composers A.to Z. Good session on computer on draft of “Women on the Home Front” based in Gd. research work in Hawick. I have had such a good reaction on my Family History Facebook page to my post on "7 Days of My Life", I have decided to create this separate blog - though it tested my basic IT skills, as it is such a long time since I last set up a blog. 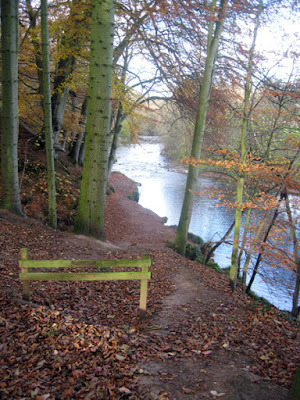 Mill Meadow walk down to the Haughhead Bridge. 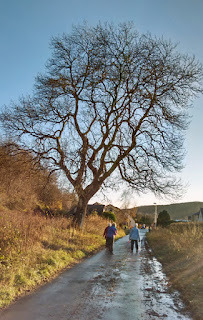 I like photographing trees throughout the different seasons - here I was struck by the lovely shape of the branches. WRI (Womens' Rural Institute) meeting with the speaker recounting her experiences of living in Italy for 25 years. It was in a village about the size of Earlston, 30 miles north of Rome and very much a rural lifestyle in a rented farm cottage, with an erratic water supply, and surrounded by vines and olive trees. The contrast with here in terms of the fresh food shops available locally - bread, pasta, vegetables etc. - was striking. J. had brought with her recipes and two of her favourite Italian dishes for us to sample - antipasti savories (courgettes, mushrooms, peppers, aubergines, salami, mozzarella, olives, salami), followed by a delicious raspberry & amaretti crunch cake, which I must try. 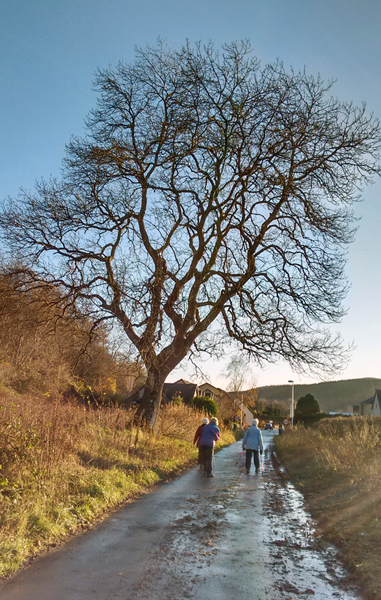 Into Galashiels for shopping. The last thing N. said was "Don''t overload yourself" - but of course I did, but so nice to get something different in the food line. So tea was courtesyy of M & S. (Marks and Spencers) - quiche and salads. Crocheted in the evening, making decorations for the Church Christmas Tree project - more of that later. 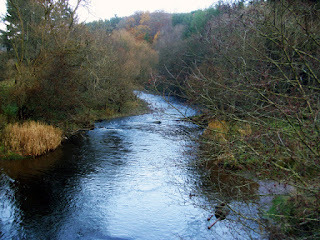 A fine day with glimmers of sunshine, so I went out with my camera into Mill Bank Woods. 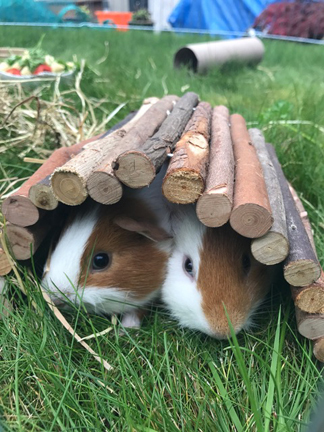 Called into G. on the way to see the latest members of the family -"the boys" - Chocolate and Marshmallow - two guinea pigs. who are being royally looked after by Nh. 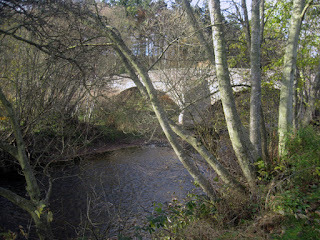 Craisgsford Bridge, built c.1737 and once the main road to Edinburgh. TV - Strictly Come Dancing live from the Tower Ballroom. Blackpool, where my parents met in 1936! Great Saturday entertainment at home, accompanied by a drink and chocolates! Lazy morning, sunny outside so we walked up to Speedy’s Wood and came back for bacon and mushroom sandwiches - our favourite Sundsy brunch. N. was on the computer when it crashed. We got a light on the hard drive But nothing in the screen which we have not had all that long. I was on such a roll with my blogs and need the main computer to attach photographs. Just hope D. our computer advisor can come round soon. At times, computers call for great patience!! Far too often computers call for great patience! Love your sleep strategy :) I’m enjoying seeing your seasonal activities and photos.